EquipHotel November 2018 is about to happen! Let’s discuss a little bit more about this Paris Fair! Paris is always a good idea, that’s what says right? We give another reason to visit this incredible city, EquipHotel November 18 will happen soon and it’s a great opportunity to visit it! DISCOVER MORE: LIGHTING PIECES THAT WILL ENLIGHTEN EQUIP HOTEL 2018! Ike Suspension Lamp will be part of this Paris trade show and we couldn’t be more happy! Ike is a simple suspension lamp, but at the same time it has character and personality. It can fit any room which make him a very versatile piece for your home. It has a scandinavian style, whith a small touch of luxury! Handmade in brass and aluminum, the glossy black finish and the copper accent deliver the perfect look to him. Duke Floor Lamp is the perfect reading light for you! It has many lighting focus that you can adjust the way you liked the most. Each cone lamp shade is conducted by a brass arm and its counter-weight. The matte black shades drape on the sides to reveal a white interior and have gold plated accents at the sockets. Important to refer that every single lighting piece can customized in terms of lighting and materials. Brubeck Floor Lamp is part of our Burbeck Family and he is a true bestseller! Dave Brubeck was an inspiration and to us still is. The base of this mid-century modern lamp is handmade in steel with a matte black finish. Brubeck is a lighting piece that all of us should have, because he is the perfect combo between lighting and music, when they are together we can only see magic happen! Are you in love with him? You can found it at the EquipHotel 2018. If you are thinking about visit Paris, this is the opportunity to have this pieces at your home! Coltrane Table Lamp is part of the Coltrane Family, another bestseller! 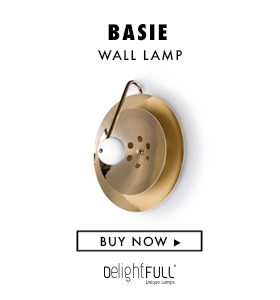 This awesome table lamp is handmade in brass and steel, with a gold-plated base that is topped up with a matte black finish on the three shades. It serves as a great bedside table lamp, as well as a unique entryway table light. Turner Table Lamp is a magnificent tribute to Tina Turner, all his rhythm and moves are here! This table lamp is handmade in brass and aluminum. The body has a gold plated finish, while the shade was lacquered a black matte on the outside and a gold powder paint on the inside. EquipHotel November 18 will happen between 11th and 15th. BE INSPIRED: WHAT’S HOT ON PINTEREST: CHRISTMAS DECORATION IDEAS FOR YOUR HOME!